For every gallon of ethanol, ethanol plants produce six pounds of high quality feed, called distillers grains. Experts agree that production and use of this feed product continues to grow, and that the significance of its place in the feed grain market is not sufficiently reported either by the USDA or the popular media. When Harold Tilstra hung up his stethoscope and sold his veterinary practice in Luverne, Minnesota in the mid-1990s to become chairman of the new farmer-owned ethanol plant Agri-Energy, that was the first time he really became aware that ethanol plants made anything besides ethanol. More than a dozen years later, as a recognized swine feed ingredients expert at Land O’Lakes Purina who regularly speaks in front of agribusiness audiences around the country, Tilstra likes to say that an ethanol plant’s product is one-third ethanol, one-third carbon dioxide (captured for industrial use), and one-third animal feed called distillers grains. Tilstra will headline the International Distillers Grains Conference in Denver on June 14 and 15. “When I first got into it, the ethanol industry marketed about 2 million tons of distillers grains a year, and this year it’s projected to top 30 million tons – that’s phenomenal growth in the space of a decade,” said Tilstra, who works in technical support for Land O’Lakes Purina’s distillers grains marketing group. The Food and Agriculture Policy Institute (FAPRI) at Iowa State University shows these numbers: distillers grains production in 2007 was 23 million tons, in 2008 it was 27.7 million tons, and in 2009 it may reach 31.5 million tons. The ethanol demand created by the 2007 Energy Act’s ethanol usage requirement, which stairsteps up to 15 billion gallons of corn-based ethanol in 2015, will bring production up to 35 million tons of distillers grains in 2011 and top out around 45 million tons in 2015, according to John Lawrence, an agricultural extension economist at Iowa State University and director of the Iowa Beef Center. Tilstra notes that at this point distillers grains have been accepted as a quality feed ingredient among a diverse cross-section of farm animal production. According to the U.S. Grains Council, livestock feeding of corn will dip from 4.6 billion bushels last year to 4.4 billion bushels this year. However, that is offset by a projected increase of the equivalent of 200 million bushels volume of distillers grains. “The simple math that I am just starting to hear nowadays is that when people look at the ending stocks in the USDA reports and total utilization, they realize that only two-thirds of that number for ethanol use is actually going away – a third of it is returning to the feed market in the form of distillers grains, ” Tilstra said. For every bushel (56 pounds) of corn, an ethanol plant produces 17 pounds of distillers grains. At 2.8 gallons of ethanol per bushel of corn, an ethanol plant delivers six pounds of distillers grains per gallon of ethanol it makes. “Because of the availability of DDGS, we have a well-supplied feed ingredients market, despite the increased use of corn for ethanol,” said Erick Erickson, on the staff of U.S. Grains Council, a group that develops export markets on behalf of corn, barley, and sorghum growers. 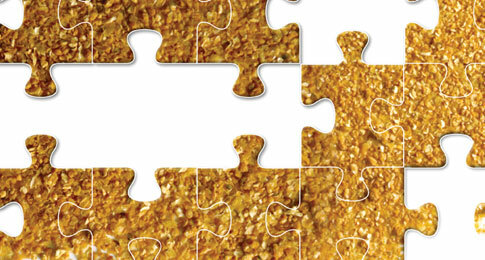 U.S. Grains Council began examining how it could incorporate marketing distillers grains into its program in 2002, and by the time ethanol industry hit its major expansion phase in 2005, its strategy was well in place. Major markets have opened in Japan, Korea, Taiwan, Vietnam, Phillipines, Mexico, Chile, and a number of other nations. “We are starting in Peru, hoping this year to make some real headway there,” Erickson said. “Distillers grains has gained acceptance as one of the alternative ingredients that feed industries find practical and useful. We just had a demo in Australia that received a very positive response. Tilstra noted that there simply aren’t any piles of distillers grains lying about – whatever the ethanol industry produces gets used. Domestically, acceptance is widespread and has reached the point where feeders and the researchers who work in animal nutrition are fine-tuning the optimal ration, based both on animal performance and economics. Lawrence notes that use of distillers grains in earlier years were valued for its protein content as well as energy. The economics of feed have shifted matters, so that livestock producers are surpassing those limits, perhaps wasting some of the protein in favor of treating distillers grains like corn, as an energy feed source for livestock. The value of distillers grains relative to corn has dropped as ethanol production and availability of distillers grains have increased, Lawrence observed. For instance, in the period between January 2000 and December 2002, the Chicago distillers grains cost 119 percent of the price of Chicago cash corn. Shifting ahead to the period between 2006 and March 2009, distillers grains have commanded only 94 percent of the price of corn on average. The U.S. pork industry is currently on the verge of profitability again, after 18 months of red ink, according to Lawrence. Though more problematic, beef cattle also appear to have a shot at profitability after two years of negative margins. Under these conditions, distillers grains will continue to be a value for the livestock industry, especially as those producers continue to find ways to use this ethanol co-product to reduce the cost of grain.